Radiology professionals know all too well the barriers PACS creates for achieving diagnostic excellence in ultrasound. At Imorgon our mission has always has been to deliver uncompromised ultrasound, restoring its full diagnostic potential. 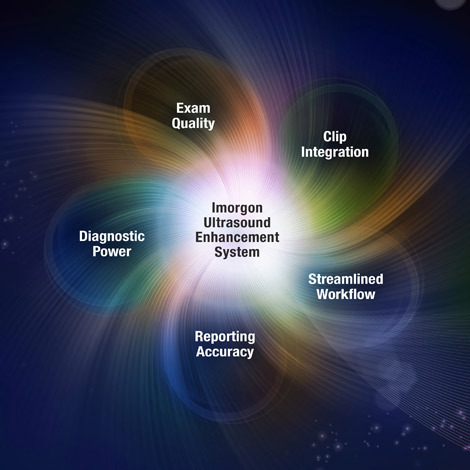 The path to diagnostic excellence begins with in-depth ultrasound workflow analysis, a discipline in which Imorgon offers decades of experience. Our consultative, client-centered approach frequently reveals opportunities for streamlining workflow and increasing efficiency, as well as for improving overall department effectiveness. Some of these improvements are process-related, while the Imorgon Ultrasound Enhancement System™ facilitates others. The Imorgon System features have been extensively field-proven by leading health care organizations throughout the USA. These enable efficient review of ultrasound studies while preserving the exam “story” as the sonographer intended. Radiologists see the entire study in context, as a whole, with dynamic clips and static images in interleaved acquisition order. Clips launch automatically and are easy to view, manipulate and control. It is also significant that they play at true frame rates and runtimes, for more accurate assessments of anatomical orientation and physiological function. The result is a more logical, precise exam review process. Ultrasound excellence benefits further from easy-to-use electronic forms and reporting. These improve exam quality control, reduce error and redundancy associated with reading and writing handwritten paper forms, and streamline workflow and communications between imaging staff. The Imorgon System also supports state-of-the-art features you may use now or in the future, such as contrast imaging, 3D/4D, advanced measurements and OB calculations.